One of my favorite things about my ebook, “Peace in the Process: How Adoption Built My Faith & My Family,” is how both my kids’ birth moms contributed their words to the story. I knew from the beginning I wanted them to share their experiences, but I wasn’t sure how they would feel about that. When they each agreed, I knew our story would go to the next level. Yes, this is my family’s story, but it’s not just our family’s story. I liked Mandy immediately and not just because she was giving Greg and me part of herself – literally. The lunches we shared in January, February, March, and April of that year were filled with conversations about TV shows, hobbies and, yes, the forthcoming adoption. Her parents and siblings supported her decision but most everyone else in her life didn’t realize she spent her first year of college pregnant. A thank you note and the biggest care package never will do the trick. I can tell her time and time again I appreciated what she did and how she handled herself – not just for herself and her boyfriend, but for us and for Cate. I hope our girl has part of her determined spirit and positive attitude. And then I can say it’s in the genes. … Once Ben was born, the nurse took him to a neighboring room to clean him up, which was Leigh’s preference. After hugging Leigh multiple times, Greg and I followed the nurse, who carried our son. She tended to him and then we held him. This great nurse even was good with the camera and took a picture that turned out to my favorite from the day. I’m also linking up this post with Jennifer Dukes Lee’s #TellHisStory and Holley Gerth’s Coffee for Your Heart. This is so moving and encouraging. Thank you for sharing your story and allowing your family to minister to others. Thank you, Karen. I'm glad you were encouraged. And I'm glad you're here. Thanks, Beth! Your encouragement has been such a blessing in this journey. Hope you have a fabulous Thanksgiving too! Love you! I'm so grateful to be able to tell my kids more and more about these women – who gave them life. I'm going to head over and your post soon. Thanks for being here, Katie! This is just beautiful! What a blessing to have developed a relationship with the birth moms to complete the circle of your family. I am glad to be here and look forward to hearing more of your story. If you live in Bloomington, we are not far from each other-I live in Cincinnati! Thank you for the link up! Ah, I love that they connected after all those years. Yes, God certainly does believe in adoption. 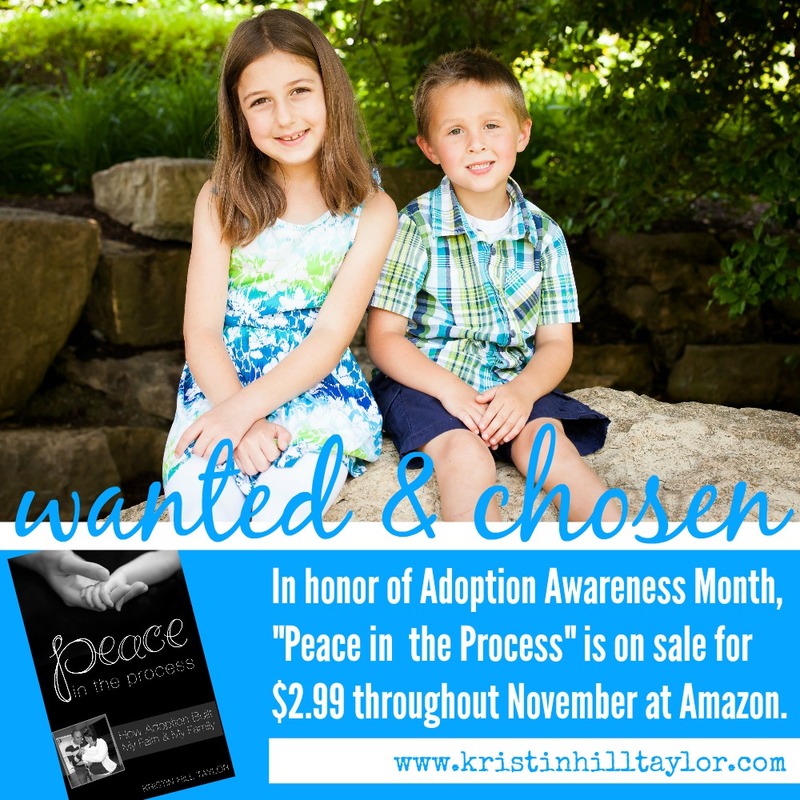 Our adoption processes taught me more about God's kingdom than anything else I've experienced. I'm glad you shared here, Susan! Thanks, Mary! We actually live in Murray, KY, which is the far western part of the state. We're about 4 1/2 hours from Bloomington and probably about 5 from Cincinnati. Bloomington just happened to be where Cate's birth mom lived at the time. I grew up in LaGrange, KY, which isn't all that far from Cincy. I'm glad you're here, Mary! Thanks, Sharita! How exciting that you're open to adoption – it's definitely been the greatest testimony to God's faithfulness in my life, such a tangible example. Happy Thanksgiving to you, too. I'm glad you're here. Wow… this is so powerful, Kristin! Congratulations on your book, of course – but even more than that – on how you are using it to encourage others and give glory to God! Happy Thanksgiving, friend! Hi, Karrilee! Thanks for your kind comment. Happy Thanksgiving to you! Finally taking time to say you have such a beautiful place here, telling a beautiful story of God's hand over your life. Your kids are adorable and you definitely speak hope into the lives of women, in adoption…but also in every area of the heart. Blessings! Thank you, Ginger, for those kind words. I'm glad to have you here.